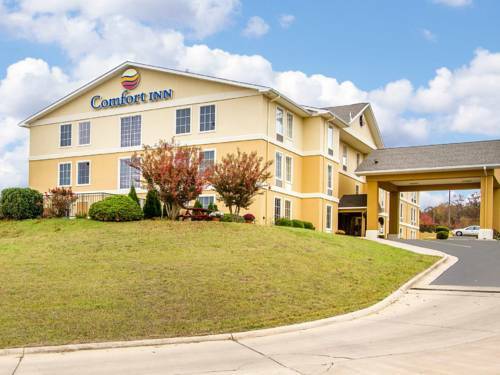 Rest and refresh at the 100 percent smoke-free and pet-friendly Comfort Inn hotel in Poplar Bluff, MO. We are conveniently close to Harwell Art Museum, Hydro Adventures Water Park, Current River and Baker State Park. Get ready to take on the day with such amenities as free WiFi, free ample parking, free hot breakfast, 24-hour fitness center, outdoor pool and guest laundry facilities. Behind every great day is a great night in your cozy guest room, which features a refrigerator, microwave, coffee maker, hair dryer, iron and ironing board. The more often you stay with us, the more rewards you earn with the Choice Privileges Rewards program. Limit 2 pets/room, USD25/stay, designated rooms only. Pet fee: 25.00 USD per stay. Pet limit: 2 pet maximum per room. Pets accepted in limited rooms. Please contact hotel. Interactive eating with dinnertime roll-pelting. Waiters, with mobile carts of hot buns, are fairly precise as they hurl bread to you from across the dining room. ~49 miles from Poplar Bluff. The Beatles changed planes at Walnut Ridge airport September 1964. The milestone was noted in 2011 with a 10-foot-tall Abbey Road album cover, fronted by silhouettes of the Fab Four, by local artist Danny West . ~57 miles from Poplar Bluff. Over the years, the town's black raven statue had been torched twice by vandals. Nevermore! The current model is more impervious to morons, standing on a small plaza flanked by an Arkansas and an American flag. ~59 miles from Poplar Bluff.